Cooking food with the sun is an ancient culinary art. It’s ideal for green RVing lifestyles and RV solar cooking is a cost-saving and easy method to do on any budget. If you want to give this ancient cooking practice a try, these tips for RV solar cooking will help you get started. If you’re looking for great reasons to get into the solar oven trend look no further. Cooking with the sun can help you save on propane and electricity costs. Solar cookers also eliminate the risk of a RV kitchen fire in your galley. 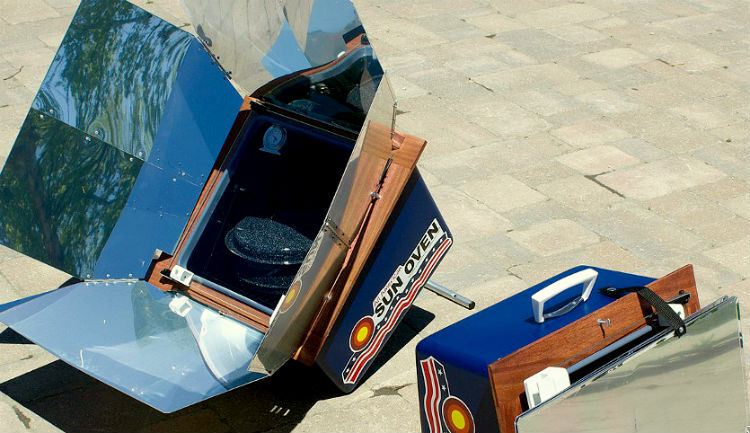 As a bonus, you can keep your RV cool during summer by cooking your food outside in a solar cooker. Solar cooking is also easier than you might think. Cook food with the sun in any season, hot or cold. 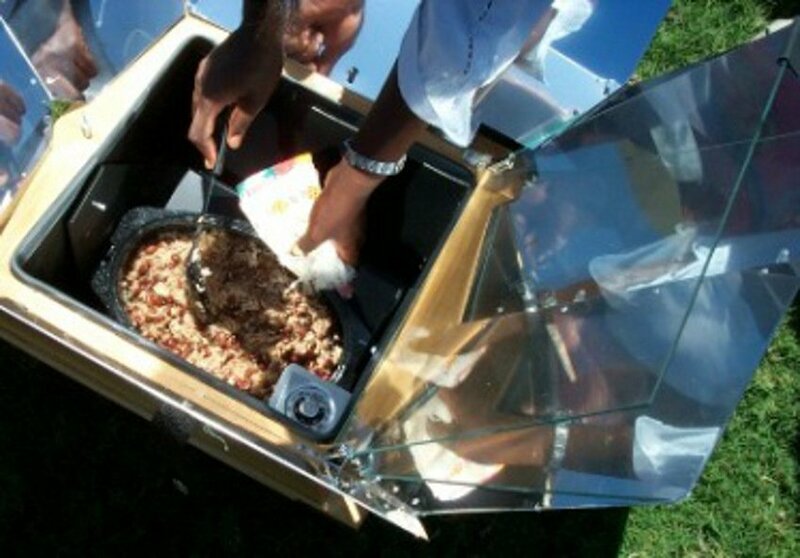 Solar ovens can bake, broil, or steam any food. Consistent, even internal temperatures eliminate the need to stir food. Even bad chefs can create great meals, since food rarely burns in a solar cooker. Cooks familiar with electricity-powered Crock-Pots will see that cooking meals in a solar cooker can be done just as easily. Just assemble and prep your meal in oven-safe cookware, place it in the solar oven in the morning sunshine and your food will be ready by dinnertime. Curious about cooking with the sun but aren’t sure you want to invest in a pre-made solar oven? The beauty of trying to make a DIY solar cooking camping set up is that you can create one with simple materials for around $20. With only three sheets of heavy duty poster board, reflective material like aluminum foil and miscellaneous crafting supplies like paint, tape and adhesive, you can make a RV solar cooking oven on the cheap. When you’re ready to invest in the real thing, one internet search reveals a handful of leading manufacturers. Solar oven manufacturers not only sell their sun-powered ovens to the public, but conduct projects that encourage third world country residents to choose solar ovens over polluting wood fires. You can find them on Amazon from about $90 for a mini solar oven to about $280 for an all-season solar oven complete with reflectors, granite ware pots, a thermometer, and water pasteurization tool. If you’re wondering why manufactured solar ovens cost what they do, it’s because a high quality, pre-made unit only requires enough sunlight to cast a shadow on the unit. On the other hand, a homemade or less expensive RV solar cooking oven will require full sunlight in order to cook evenly at desired temperatures. Dehydrate nearly any food – from vegetables to meat. Cooking with the sun makes total sense for RVers on the move. Whether you’re looking for new dry camping tips or seeking the sun during winter, these little units should be in every RVer’s bag of cooking tricks. If you’re a RV solar cooking fan, let us know your best tips for creating great meals with the sun. Can you say “Solyndra”? Sorry, but “alternative energies” aren’t ready for prime time yet. The proof is in the fact that none of them, solar, wind, yada, yada…can even survive, without the massive government subsidies they get, and even WITH those subsidies, they fail. Again, can you say “Solyndra”? Forget alternative energy sources, and stick with what’s proven and works – for now, at least. The rest is hype. My friend it might be tough to smell the coffee if a cloud passes over Robert. I’m in the application process for the concession of picking up dead and maimed endangered species of birds that are hit by those large wind turbines you like to look at, Next time you can think of me picking up eagles, spotted owls etc. that have a hard time negotiating their natural thermal routes that someone stuck a swinging guillotine in the middle of – lots of them! I’m going to put some attractive remnants on pendants and other jewelry to sell at tourist attractions. I can claim that they were provided by renewable resources even if the birds aren’t. The solar stove might be a fun idea for an afternoons worth of entertainment but for regular use, the fun evaporates pretty quickly. I used one. Happy New Year my friend, and may we have a better New Year than our feathered friends. If you think current energy source does not receive government support, you should think again because it does and in many forms. Also, we are wasting our current energy source while/because it is cheap and abundant just the same as we wasted all the virgin timber in our entire nation and have little to show for it. Looking to the easily foreseen future and learning from our not too distant past can show us a better way forward. In my considered and 72 year old opinion, those who don’t or won’t play with the future of sun and wind and all the various potential benefits are either very lazy, very uneducated or simply too set in their ways to envision a whole new world that no longer relies on coal and oil to fuel it. And, amazingly enough, the poor folks in places like Africa and South EAst Asia are leading this parade. They have no hope of having central air and heat or modern electric stoves, microwaves and hot water heaters. Disease is killing many millions each year simply because they lack clean water and, yet, the idea expressed here on using natural sources of energy to cook, heat and even clean drinking water will be driven by these folks who need it the most while the fat cats just pass it by until the day comes that even they have no more clean water etc. Think of how clean the air would be if all burning of coal or oil was stopped? This was an amazing article with far far ranging applications that are badly needed right now. My 69 years worth of observation agrees with you, 72-year-old John. We will stop using oil and coal completely once other sources become cheaper. Hopefully not because of taxes etc. but because they are more efficient. We may get there by the next millennium but until then, we will continue to use what works best and gives us the biggest bang for our buck. I’m forward thinking too, I think we should drill comets, planets, and asteroids. But we should drill earth first as long as “thears ol unda them thear hills”. If there is one essential characteristic of a boondocking food supply, it is reliability. To depend on the sun shining to cook your food when you want it is not realistic. Solar cooking should be considered entertainment; not subsistence. To reliably cook from the sun is possible with induction as state-of-the-art campervans demonstrate. Solar energy is captured any time it is available and stored in a battery for later use anytime you want to cook. That way, a steaming midnight cocoa. prepared from solar energy is easy and without the stink and risk of open flame propane. Solar power and wind power, in my opinion, are good on a home scale such as an RV or a residence. But we deceive ourselves thinking massive acreages of solar farms or huge commercial windmill farms are “green.” For example, large commercial windmills kill thousands of birds, including raptors which are supposed to be protected. Here in Arizona massive thousands of acres of Sonoran Desert habitat are being stripped and graded flat to make way for solar farms, destroying a tremendous amount of habitat. (And we have the gall to criticize the Brazillians for stripping the Amazon rain forest for cattle ranches, soy farms, or mining.) Solar installations that reflect and concentrate the sun on a central tower instantly fry birds that fly through. Thats why small scale wind or solar (home or RV for example) is benefical, but commercial installations are ecological disasters. That’s not even mentioning the visual clutter destroying what used to be great natural vistas. Considering that for every bird killed by a wind-turbine, over 10,000 are killed by cars, windows, pesticides, and cellphone towers; you might want to look at the major causes.. Reducing pollution will have a greater effect on the health of species in our environment. Solar concentrators, that create heat for power, are normally located in desert areas; those are not areas where birds are in abundance. Is there anyone out there who has actually used a solar oven? I would really be interested in hearing from someone’s experiences, tips and hints about using a solar oven.